Back from a short reprieve.... we give you an update of the “All Out Against Borders” mini tour. This was a first for us, playing four shows within five days, in four different regions of Southern Arizona. This tour took us as far south as Pasqua Yaqui territory(SW of Tuscon), all the way north to the Salt River Communtiy (Phx,AZ). 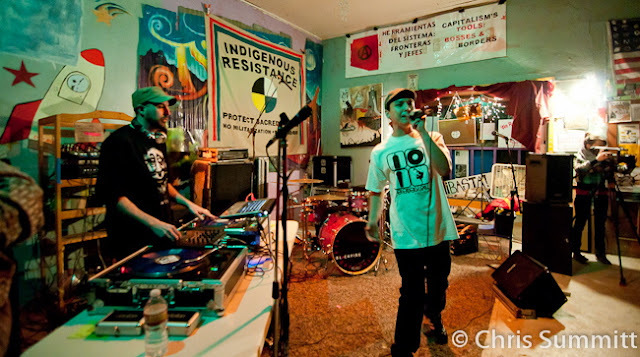 We had the honor of rockin' it with some awesome talent all along the way; blessing stages with Dj's, Hip-Hop and Punk Rock artists, spoken word poets, and grassroots activists. First stop was Tuscon, AZ @ Dry River Collective. A diverse crowd gathered to see performers and hear testimony from youth and elders whom experience first hand the imposition of borders on there communities. 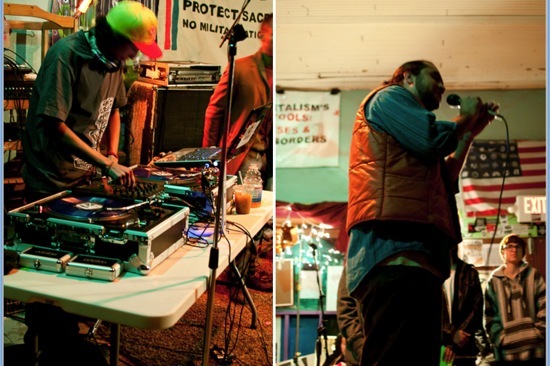 Founders of Elementary Hip-Hop Skool, DJ Alias and MC Progreso kicked off the BP6 benefit show with some ill tunes. 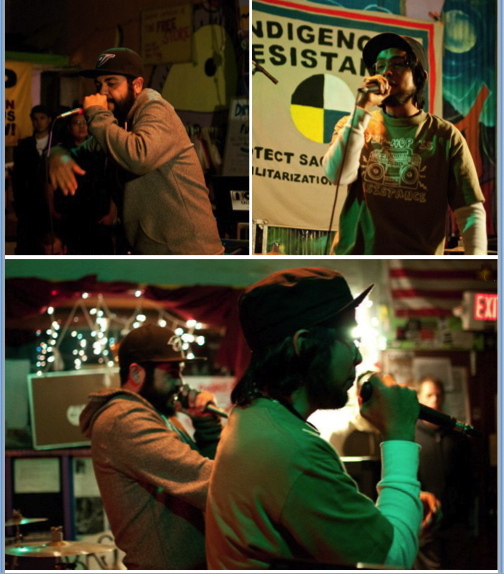 Between tracks MC Progresso shared his personal thoughts and experiences of separation and displacement with the existence of the current US-Mexico border wall and elaborated on how we need to unite in opposition to it. This act was followed up by another mainstay out of Tuscon, DJ Lingos and Cozmo Brown. They put down a unique set that contained varying soundscapes, funky grooves, and thought provoking word play. Next was us. We were real eager to play because a lot of our new material was fleshed out just days prior and we wanted to test it out. Folks dug the new tracks. Much to our delight, DJ Alias made an impromptu appearance with us, cutting it up as we performed our “Battle Phoenix” joint. During our set we made it a point to addressed the issues around the militarization of the border and the necessity to work together to build and maintain resistance against entities that dominate through fear and violence. Last but not least the headliner of the night, BLACKFIRE (Flagstaff, AZ) opened up their set sharing some traditional songs using a hand drum and voice. 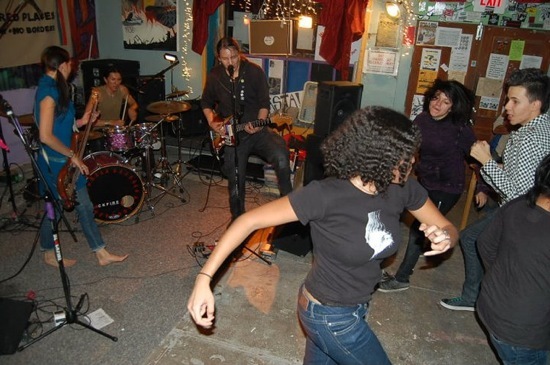 They transitioned to a booming and energetic set that prompted many of the youth to form a mosh pit, Oh Yeah!!! 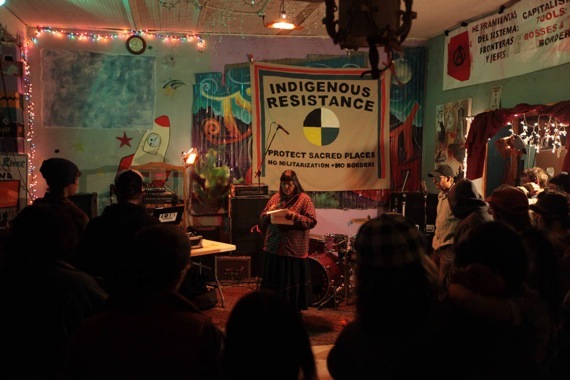 In similar fashion, BLACKFIRE, throughout there set addressed the urgency that we as a people need to be taking direct action toward the abolition of all borders. This gathering made for an awesome night.Thanks to all the elders, organizers, participants, and supporters for making this benefit a success! 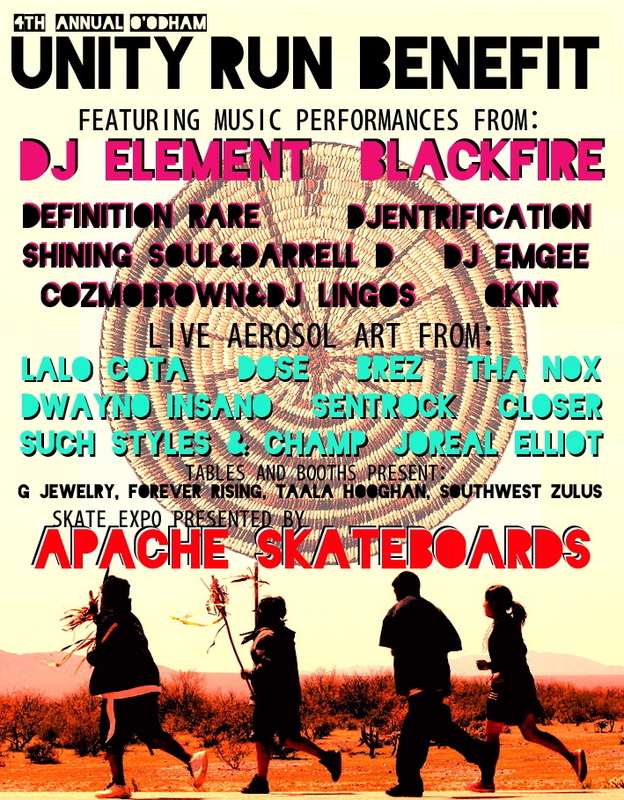 The culmination of our travels brought us to the 4th annual O'odham Unity Run Benefit hosted by the Salt River Community. This was an all day event held to raise funds and spread awareness about the week long trek that started in Salt River and finish in an O'odham village in mexico. We were very fortunate to have been part of this year's benefit. Lots of positive energy was emanated and a lot of proceeds were raised . Big up to those that traveled far and wide to be part of the event. Til next year! Special thanks to all the community members, elders, participants, supporters, and organizers.